Following inception in 1985, ABLE quickly identified the importance to it’s business strategy of developing a significant profile within the EPC Project arena. To that end substantial effort was expended establishing credibility and building relationships with major Engineering Contracting entities and their end users, achieving qualification and securing approved vendor status by demonstrating technical competence and experience. Inward investment in personnel and structure at an early stage strengthened ABLEs ability to manage the complexities and successfully complete EPC Project orders, which led to our first major Project award for the BP Miller Platform in 1989. Subsequently, Project Orders became an integral part of ABLEs income stream and by understanding and accommodating the erratic nature and large individual value of these orders, they are projected and expected within our annual business planning. 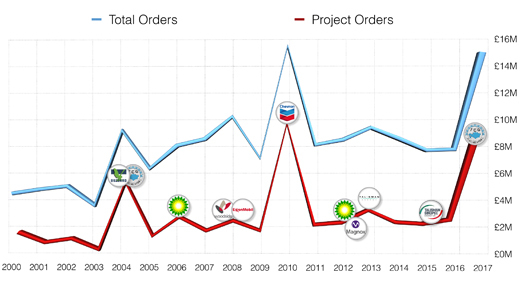 As can be seen from the graph below, Project Orders continue to be an inherent part of our business. Click here to learn more about the example Project Orders depicted.